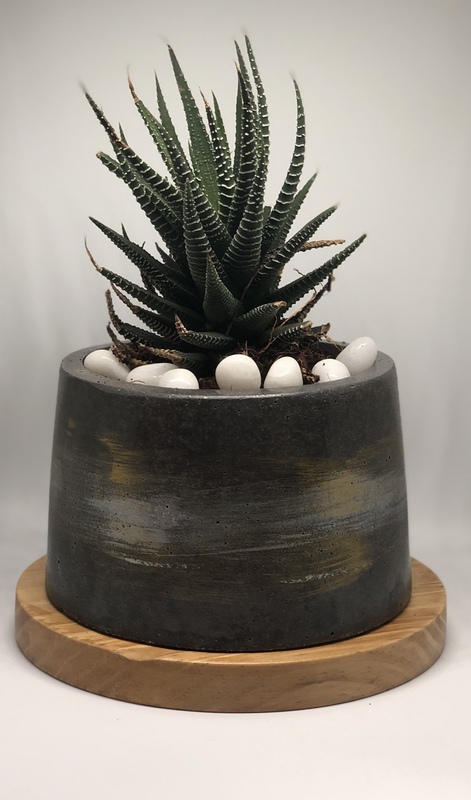 This product comes with a live Haworthia (Zebra) in a cement planter with polished marbles for decor. Zebra Hawarthia or Haworthia atenuata is a succulent plant that can last a lifetime. Because of its low maintenance requirements, it is a great starter plant for your home or office or for those with a busy on-the-go lifestyle. It has green triangular leaves, with white stripes across it that gives it that “Zebra” effect. The leaves are clustered together. It generally doesn’t grow flowers, but if the plant is grown outside the given planter under the perfect shade and feed conditions – it will shoot a long thin flower spike from the center.